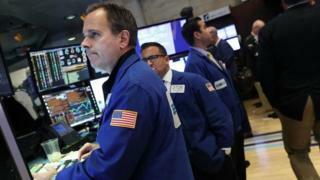 Tech stocks weighed on Wall Street on Thursday as both Apple and eBay saw their shares fall. Shares in Apple closed 2.4% lower amid worries about levels of demand for its new iPhone 8 and iPhone 8 Plus models. Shares in online marketplace eBay dropped 1.8% after it warned late on Wednesday that profits in the current quarter could fall short of estimates. These falls contributed to the tech-heavy Nasdaq index closing down 19 points or 0.29% to 6,605.07. However, the Dow Jones notched up another record close of 23,163.04, edging up by 5 points or 0.02%, after closing above 23,000 for the first time on Wednesday. The wider S&P 500 index also inched up by 0.94 points or 0.03% to 2,562.10.